The Side Delivery System is designed for easy installation and removal allowing versatility to your existing self-propelled chip spreader. This easily installed attachment allows you to widen roadways, place bedding materials, spread free flowing materials in shoulder rehabilitation programs with little or no waste. All parts necessary to provide a complete side delivery system are included and shall conform in strength, quality of materials and workmanship. 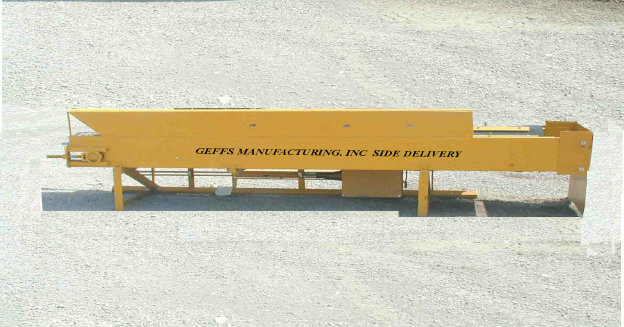 The Side Delivery System is attached to the GEFFS Manufacturing, Inc., W.H. & Sons, or other manufacture self propelled chip spreader for the use of shoulder rehabilitation and/or for filling shoulder in after over lay programs. It can also be used to fill trenches with appropriate materials for back fill. The material is elevated from the rear hopper to the front cross conveyor. The material is then transported to the shoulder or trench for filling. One (1) each 24 inch wide conveyor and 12 foot long fully enclosed conveyor with dual side seals and chute. The conveyor is a 220# belting with variable speed control with self cleaning and adjustable tail pulley. Adjustable front idler is provided to assure proper tracking on head pulley. On integrated self-supporting frame is provided for storage when not in use. A strike-off or finish blade is available to allow leveling of materials applied to road surface. This blade is 18” X 60” with an adjustable end wing. Mounting kit is welded to the main frame of the chip spreader. Blade is hydraulically adjustable in height from 2” below grade level to 6” above grade level. The blade tilt is hydraulically adjustable. The blade back angle is adjustable manually prior to use. The height and tilt are control from the operator’s station. This left hand discharge side delivery is equipped with one (1) each 24 inch wide conveyor serpentine belt that is in a fully enclosed conveyor with dual side seals and chute. The conveyor is a 220# belting with variable speed control with self cleaning and adjustable tail pulley. Adjustable front idler is provided to assure proper tracking on head pulley. This unit can be hydraulically extend from 12 ft to 14 ft in the direction of discharge. A integrated self-supporting frame is provided for storage when not in use. A strike-off or finish blade is attached to allow leveling of materials applied to road surface. This blade is 18” X 60” with an adjustable end wing. Blade is hydraulically adjustable in height from 2” below grade level to 6” above grade level. The blade tilt is hydraulically adjustable. The blade back angle is adjustable manually prior to use. The height and tilt are control from the operator’s station. 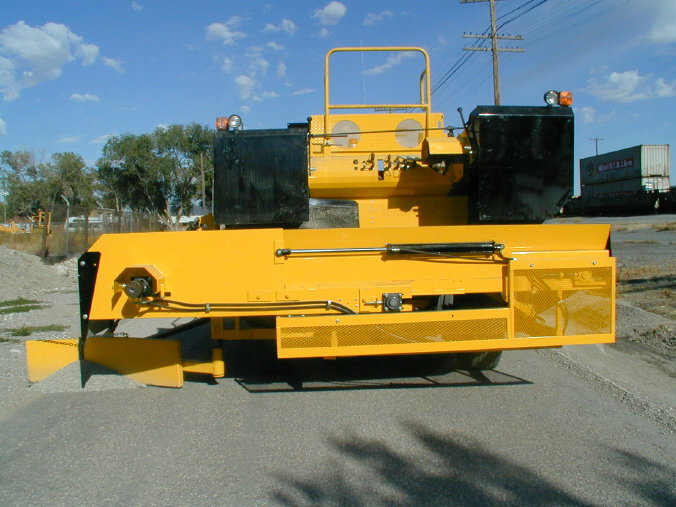 A strike-off or finish blade is attached to allow leveling of materials applied to road surface. This blade is 18” X 60” with an adjustable end wing. Blade is hydraulically adjustable in height from 2” below grade level to 6” above grade level. The blade tilt is hydraulically adjustable. The blade back angle is adjustable manually prior to use. The height and tilt are control from the operator’s station. This right hand discharge side delivery is equipped with one (1) each 24 inch wide conveyor serpentine belt in a fully enclosed conveyor with dual side seals and chute. The conveyor is a 220# belting with variable speed control with self cleaning and adjustable tail pulley. GEFFS SIDE DELIVERY SYSTEMS make shouldering a cleaner, easier, and safer task. Truck never leave the roadway. GEFFS Side Delivery Systems are quickly installed. Simple to operate.